Having a good cell signal is necessary for working remote and a safety feature when traveling off the beaten path. It can save you money, allow you to plan your trip to the grocery store, and find the perfect camping spot instead of wasting gas by driving around. With a smart phone you can look up camping restrictions, how to repair your vehicle, or download podcasts. You can even read sweet DIY tips on parkedinparadise.com! There are countless ways to get internet on the road. And a variety of data plans; too many to cover in detail here. One popular method (and the one we use personally) is using your mobile phone as hotspot tethered to a laptop. We each have a different phone plan (one is on Verizon and the other T-Mobile) to maximize our chances for getting the best signal. This set up works well in the city, but as we get further away from civilization the signal starts to fade. That’s where cell phone signal boosters come in! In this article we look at what a cell signal booster is and how to make use of one. With a few bars of service: the signal can be boosted enough to stream videos and upload large files. If you’re the observant type, you’ll also notice that putting your phone in a metal van hampers the quality of reception. A cell signal booster also eliminates this problem. Another benefit is these boosters will often save the phone’s battery power. Your phone is working harder when the signal is weak, which eats into its battery life. While a cell booster takes more power to run than it saves in your phone, it is nice not needing to plug the phone in as often. A cell phone signal booster can improve your phone’s talk time by up to two hours in poor signal conditions. External Antenna: This antenna is mounted on the outside of your van and picks up cell signals from the towers, transmitting data to and from them. Signal Booster: This is the part that takes the cell signal and amplifies it. It takes some power to do this (usually about 2.5A) and can be turned “off” for when you’re not using data. Inside Antenna: This is like a mini cell-tower inside of your van. It creates a small boosted signal that has a limited range from where you place the inside antenna. Essentially, you will only get a boost while you’re in your van, as it quickly looses potency when you move away from the inside signal. Cell signal boosters are compatible with all major consumer data carriers. There is no extra fee or plan you need to sign up for as they are just boosting your existing signal. These devices are easy to set up and designed specifically for cars, trucks, RVs or campervans. That means they will wire straight into an existing 12V system. Having a poor (or no) cell phone signal can make it difficult to find cheap or free campsites and cause you to be more stressed out if you need to remain in touch with people. A cell signal booster reduces how often this happens. We have parked our van miles away from the nearest town and still had enough signal to stream entire movies off of Netflix for days, and that’s pretty cool. High upfront cost is probably what makes people most skeptical about these products. While they are not necessarily cheap, if you are doing any remote work or need to be on call these are worth their weight in gold. There are some precautions about how close you should put your phone and person to the interior antenna, as the boosted signal is quite powerful (it might damage your phone). The WeBoost units all fall under the FCC regulations so they are plenty safe, which I can fairly confidently assume because we haven’t all suddenly started growing extra limbs from 10 years of rampant public cell phone use. What Are The Best Cell Signal Boosters? The biggest and best player for signal boosters in the U.S. is WeBoost (formerly Wilson Amplifiers). They have several signal boosters ranging from household to handheld, but we want to look at the three that we recommend for camper vans and RV living. Dimensions 4.375" x 6.375" x 1.375" 21.75" x 1.50" x 3.50" 4.375" x 6.375" x 1.375"
We currently own the weBoost Drive 4G-X and couldn’t be happier with the product. It has consistently been one of the most powerful, professional grade boosters sold. That means you’re going to get the fastest speeds and best streaming. The booster is easy to get up and running. In the box there are just four main parts: an outside antenna, inside antenna, booster and power supply. The power supply can be plugged straight into your camper van cigarette lighter – or you can wire it into your 12v system. You’ll want to place the booster somewhere within reach so you can turn it off when you’re not using it to save power. This booster is meant to be mobile so it’s ideal for a camper or RV. It can be mounted horizontally or vertically anywhere in the vehicle. The outside antenna needs to be mounted on a metal roof for the best signal. For this reason, we recommend the 4G-X OTR if you happen to have a fiberglass or different material roof. The specs for the weBoost Drive OTR is the same as the 4G-X above. The difference lies in the antenna. The OTR version comes with an all-weather truck antenna. This antenna is quite a bit bigger and meant to be mounted vertically on a semi-truck cab or mirror. An all-weather antenna is going to be less stealth than the standard 4G Drive version. But it will be easier to mount to a ladder or vertical surface outside the van. For our build, we purchased a separate OTR antenna to mount on our ladder after realizing the standard antenna wouldn’t work with our custom fiberglass top without mounting a big metal plate on the roof. 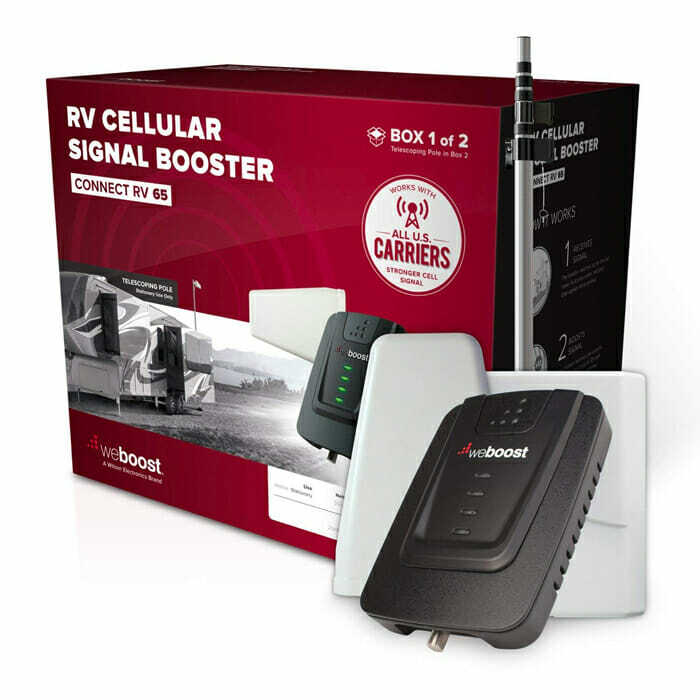 The weBoost Connect RV 65 is the most powerful cell phone signal booster you can get from Wilson Amplifiers. It operates in much the same way as the smaller signal boosters but there are a few main differences that set it apart. The most obvious is a large telescoping pole for the outside antenna. The Connect RV has a directional antenna rather than omnidirectional like the others. This means you will have to position the panel facing a cell tower in order to get the best reception. There are quite a few phone apps that help you locate cell towers. The telescoping pole extends to 25ft. tall at maximum height and shrinks to 6ft 2in at its smallest. The pole is necessary to keep the external antenna far away from the internal one, otherwise feedback (called oscillation) can occur between the two. This is similar to the effect of a microphone getting too close to speakers, and can make the booster practically useless. Most people find that it takes approximately 10 minutes of set up at each location so it’s not something you would want to use if you plan on moving frequently or on the go. Because the FCC limits moving vehicle signal boosters to 50dB, and this one is rated for 65dB, it is only supposed to be turned on once you’ve set up camp anyway. This device is designed for RVs and houses, so it plugs into a 110-240V AC outlet, meaning you will need an inverter to run it. The box comes with all of the mounting hardware including brackets that you would need. At 65bB max gain, you won’t find a more powerful booster. There are other companies that make signal amplifiers. However, weBoost ticks every box that we were looking for. Performance: This is the first thing you should look at when deciding on booster. You’ll see a max gain rating on each signal booster. Max gain is a measure of signal strength and can range anywhere from 20dB to 65dB. A max gain of 50dB means the signal coming out of your booster is 50dB stronger than the un-boosted baseline. Frequency: the frequency your cell phone emits signals depends on the carrier. You can see supported frequencies listed as “bands” on each product. weBoost supports all of the major carriers so it is not something you will generally have to worry about. However, if you’re looking at cheaper alternatives it’s important to look up which specific frequency your cell carrier uses to be sure the product is compatible. Number of Users: Cell signal booster can support multiple users, but not all of them do. With the devices we reviewed you can link up cell phones, tablets and even laptops if they have their own wi-fi signals. We have linked up to four devices to our 4-GX with no issues. Omnidirectional: The 4G-X devices have omnidirectional antennas. But that’s not the norm. Some signal boosters like the Connect RV have directional or panel antennas. That means you have to point the antenna directly at the cell tower to get the best signal. Network Speed: Signal boosters are rated for 3G, 4G LTE networks. Consider what type of phone network you currently make use of. Some folks are signed up with inexpensive 3G plans and don’t need a full spectrum boost. Installation: We like the fact that weBoost has a minimal amount of parts and can be plugged directly into the cigarette lighter of your camper or RV. When looking at other brands, consider if other parts are required for installation. Make note of your wire length before installing so you don’t end up running short. Saving phone battery and data is an important issue when you are frequently traveling. Turning off mobile data updates before you leave is a good way of ensuring you won’t be wasting precious electricity on the road. If you’re traveling with a partner, consider using two different carriers. That way you’ll be most likely to get the best coverage. Look at coverage maps for areas that you plan on spending the most time. Use phone apps such as Sensorly to see if areas you’ll be traveling to have reported cell coverage. Sometimes this can be the deciding factor for potential campsites. Plug the phone directly into your laptop for tethering to save on battery and less heat damage to your phone. Download long movies on tablets or your laptop at a Starbucks or library while you have signal so the entertainment is ready to go for later without streaming. Keep your signal booster off when you’re not using it. The boosters draw a bit of power and you don’t want it to drain your secondary batteries for nothing.